All of our services come with a written guarantee. We have over 20 years of experience working with texture and we know how to deal with it. 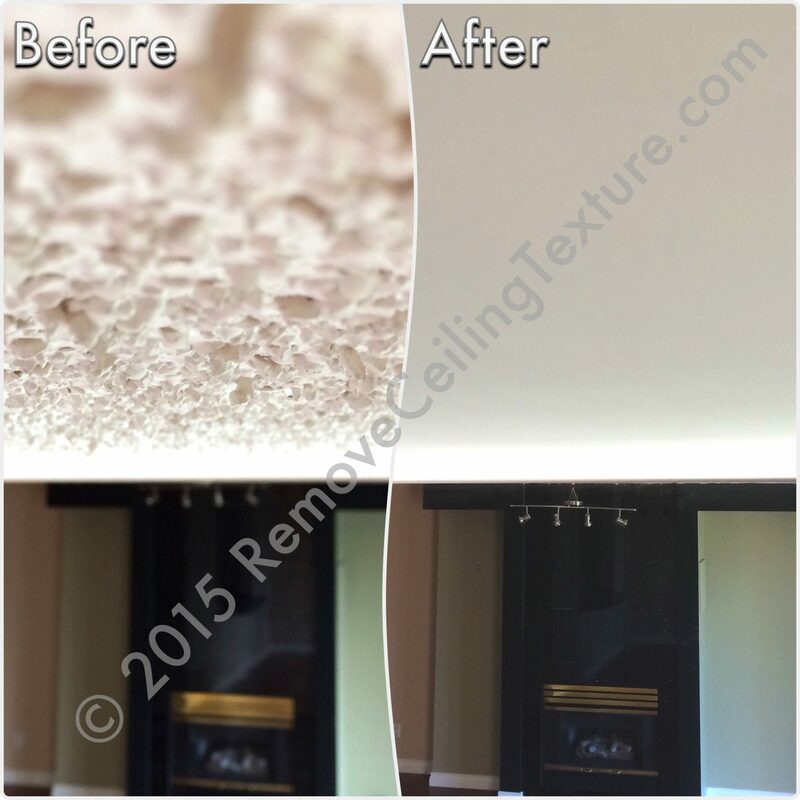 Give RemoveCeilingTexture.com a call TODAY to take care of that ceiling texture. Why should I remove my popcorn ceilings? Removing popcorn ceiling texture is (usually) a messy and time-consuming job. However, we here at RemoveCeilingTexture.com have over 20 years of experience handling popcorn ceilings and we know how to make the process quick, efficient, relatively clean and headache free. Plus we also offer an exclusive process which does not require scraping of the ceiling texture for those occasions where the ceiling texture has been painted or it contains asbestos and it should not be scraped. The above method results in a smooth, paint ready ceiling. Don’t worry if the underlying surface below your current textured ceiling is not smooth. We always even out the imperfections when skim coating the ceiling. Our exclusive method involves no scraping, so it will not disturb the existing ceiling texture. It is much cleaner that the conventional texture removal method, and it produces a far more durable product than a standard drywall ceiling. Do you have Asbestos in your ceiling texture? Our exclusive method is especially effective if you have asbestos in your ceiling texture because it doesn’t disturb the asbestos. Instead it burries the existing ceiling texture in a bonding agent followed by a cementitious coating. This will seal in the asbestos and the ceiling texture for the rest of your home’s life, therefore eliminating the threat of air-borne asbestos from ceiling texture. We serve all of Metro Vancouver communities including Vancouver, Burnaby, North Vancouver, West Vancouver, Richmond, New Westminster, Coquitlam, Port Coquitlam, Port Moody, Pitt Meadows, Maple Ridge, Surrey, Delta, Langley, White Rock. Many of our clients have asked if we paint the ceilings once the popcorn texture is removed and the ceiling is smooth. The answer is, it’s up to the homeowner. Some homeowners prefer that we do the painting of the ceiling once it is smooth. Others have their own painter do the painting once we are finished with the ceilings. Either way, the ceiling needs to be painted once the popcorn texture is removed and the ceiling is re-finished by us. Greater Vancouver Home Builders Association in conjunction with Canadian Mortgage and Housing Corporation have put together an excellent guide for homeowner who are looking to hire a contractor. As a contractor who believes in integrity and homeowners’ rights, we would like to urge you to download this guide and read it carefully before hiring any contractor to perform any work in your home. Click on the icon below to download this useful guide titled “Get it in writing”. This guide is in PDF format. We serve all Metro Vancouver communities including Vancouver, Burnaby, North Vancouver, West Vancouver, Richmond, New Westminster, Coquitlam, Port Coquitlam, Port Moody, Pitt Meadows, Maple Ridge, Surrey, Langley. Thinking about doing something about those ugly ceilings? Click here to get in touch with us!